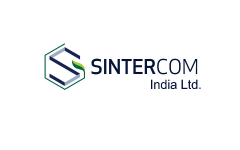 Business description - Sintercom is a manufacturer of sintered metal products, machining and assembly of metal components and is currently engaged in the business of manufacturing sintered metal automotive components of engines, transmissions systems, body chassis and exhaust applications using sintering manufacturing processes. The company’s products are used in the commercial and passenger vehicles. The company was incorporated in the year 2007 and subsequently the commercial production started in 2009, from manufacturing plant situated at Gat No. 127, at Post Mangrul, TalukaMaval, (Talegaon-Dabhade) Pune-410507, Maharashtra which is spread over 42,189.06 sq. feet and comprises of registered office, out of total area of 215278.00 sq. feet. It started the business by selling its product Hego Bosses to Tier-1 automotive exhaust system manufacturing companies in India and globally. The company mainly caters to the domestic OEM buyers in automotive segment, resulting into 87.98% and 79.74% of revenue from operations for the period ended 30 September 2017 and year 2017 respectively. Currently, it caters to OEMs like Maruti Suzuki Limited, Mahindra & Mahindra Limited, Bajaj Auto Limited and Fiat India Automobiles Private Limited. It has an in-house dedicated Research & Development team and has been developing new products in engines, transmission systems and body chassis for OEMs and Tier-1 customers. The main product line of the Company is manufacturing of high strength structural sintered components of Engine and Transmissions. Sintercom IPO allotment status is now available on Link Intime's website. Click on this link to get allotment status. In current market conditions; better to save money rather than taking Risk !! Sintercom got 12 crore from anchor investors!! Yeah, who does business of 66 cr and get only 1.6 cr in return. Very small profits for all these years and suddenly it is all good. The books are obviously cooked up!! They think investors are fools! Sintercom in good field but their performance is rubbish.